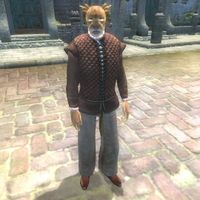 S'shani is a Khajiit savant and retired ship's captain who is a permanent resident on The Count's Arms in Anvil. While most other pensioners tend to spend their life of leisure relaxing and doing as little as possible, S’shani keeps himself busy and spends all of his time either wandering around Anvil or paying unexpected visits to his many acquaintances around town. At the Count’s Arms, he shares a room with another person associated with the sea trade, namely the ship’s clerk Didier Aumilie. The room is located in the southwestern part of the Private Rooms area above the taproom and S’shani sleeps there every night between midnight and 8am. After waking up he spends a few hours wandering around near his bed. At 10am he will look for his friend Newheim the Portly who will be on the dockside on all days but Sundas, when he is walking around Anvil. At midday, he enjoys a two-hour lunch at the Count's Arms, then pays a visit to Norbert Lelles in his shop Lelles' Quality Merchandise on the dockside. At 4pm he heads back inside Anvil and enters the local weaponry store, Morvayn's Peacemakers, for a chat with Varel Morvayn. Outside those times he typically hangs around the taproom in The Count's Arms, but when not eating or sleeping there is a 25% chance on every hour, or when the player changes cell, that he will head for an hour's meal in Jesan Sextius’ house. He wears a set of common middle class clothing, a pair of doeskin shoes, brown linens and a quilted doublet. He carries around a leveled amount of gold. When you meet him for the first time, he will be politely introduce himself and his position in life: "S'shani. The old sea captain and rover... now a shipowner and fatcat. Pleased to meet you." And like most of the other seamen in Anvil he tends to get quite philosophical when asked about Anvil: "Take some advice? Go down to the sea, stand a while. Watch the sun rise and set. Think on the distant lands across the water." Funnily enough, S'shani is a member of factions for both the friends of Jesan Sextius and Newheim the Portly; the members of which have a +5 disposition boost torwards each other and a -20 disposition decrease towards the members of the other faction, which means the people who are supposed to be S'shani's friends actually have a -20 disposition towards him, as only the lowest disposition modifier from all factions a given NPC is in are considered. S'shani owns the other white horse in the corral outside town, although he never uses it.